It has been a while since I've posted. This is due to a number of health problems that my wife has been going through. They have been eating up a lot of our time but they seem to be steadying off a bit. To the left you can see some of the "good guys". The eight regular infantry regiments (there are also two irregular regiments) are shown above. By the way, the unit in yellow coats are the von Pilsen Pioneers. These veterans are not only a solid combat unit but are available for engineering duties when required. Below them are four units of Horse (in darkened cuirass) and four units of Dragoons (in red coats). And to the left you can now see the regular line troops of the "bad guys" . . . yes they are those much despised vile Stagonians in another combined photo. The regiment with light grey caps are the "St. Cyr Sappers" (similar to the von Pilsen Pioneers in that they are also an engineering unit). Beneath them are the four Horse (blue coats on the left) and Dragoon regiments (on the right in variously colored coats) of Stagonia. Not shown are the jagers of both armies. Each has four units of 12 figures each (all individually based on pennies). 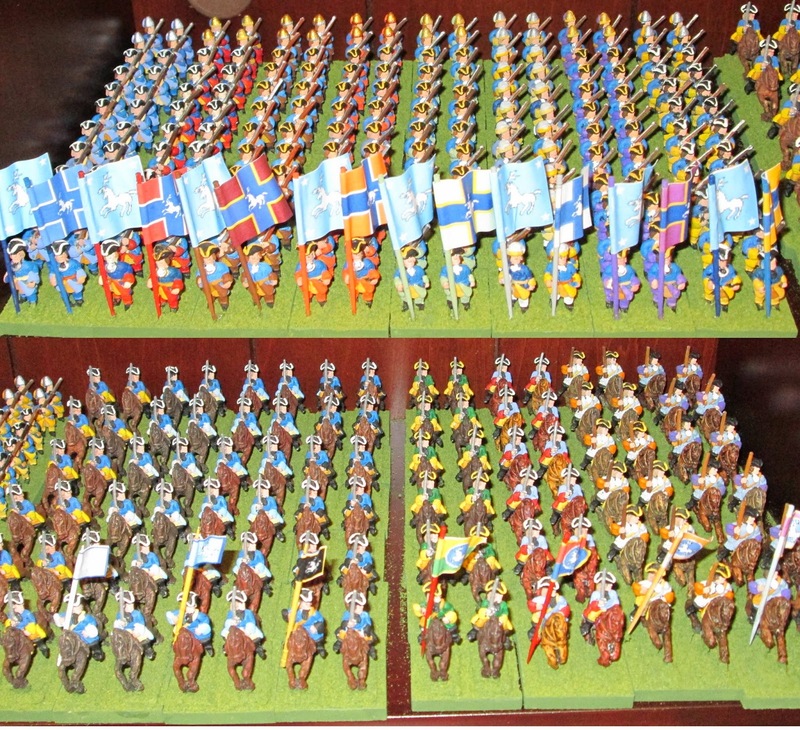 The irregular foot (two 24-man units each) and light horse (two 12-horse units each). Also not shown are the Generals, Brigadiers, Aides de Camp and Artillery . . . but they are all painted and ready as well. 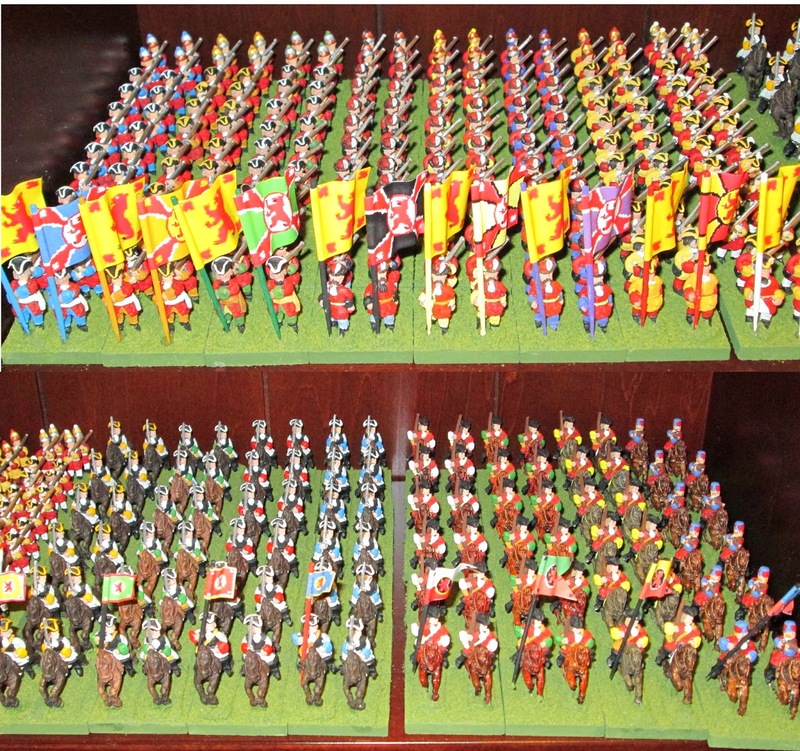 An impressive and colourful array of troops Jeff! Very eye catching. Thank you, Scott. It has been (and essentially correctly) said that the proper color for any army in the field is "mud" . . . but I don't care . . . I like color. Sorry to read your wife's health problems. I hope she is doing better. The figures look fantastic and very cleanly painted. I look forward to seeing them all deployed on the battlefield! Thank you, John. Sadly my wife's health issues are not going to disappear any time soon . . . but we are getting a handle on them for now anyway. I no longer have to take her twice a day to the Hospital for three hour IVs. But she is now taking blood thinners for the blood clots they discovered. It will be a lingering process of recovery but at least we currently have a handle on it. I've been away for a while Jeff, and had to close down my own blogs ("At the Old Dessauer's Table" & my Story blog etc) but now I'm back and posting again (under my pseudonym, Bob Black). Sorry to hear about the health problems (age catches up on us all - I myself recently underwent surgery on my eyes) but I hope things will improve a little soon. Very impressed by the figures Jeff. Can you give us a little more detail about them (say, scale & manufacturer). I intend to go back and read more of your posts to catch up on what you've been up to. Sorry to read about your good lady. I hope things work out and I wish you both health and happiness. The figures look splendid on parade. Very nice. Welcome back, Steve. If what you had done to your eyes was cataract surgery, then if you are like me, it will make a huge difference. I had this in both eyes last year and it made a huge difference. The figures are all from Lance Runolfsson's "Blood Axe" ranges (which are currently handled by Historifigs . . . although I do not believe that listings are online yet, so write them). Most are from either the WSS or GNW ranges although a few of the irregular horse are from his Renaissance ranges . . . note that these are not pictured. They are nominally 25mm but are hefty so that I think they'd be called 28s nowadays. The sculpting style is rather different from most sculptors so I'm not sure how compatible they'd be with other manufacturers. That being said, they are VERY easy to paint since they tend to lack extraneous equipment. As Lance once told me, "If you wouldn't notice it at 100 yards, why should I sculpt it?". The Blood Axe figures would not be to everyone's taste but I think that they are wonderful wargames figures for the table top. I'm facing more chemo since the cancer has moved into my lungs but we all have to deal with things as we age, don't we. I will try to post some photos of my Dark Ages figures from Blood Axe sometime soon (with more close-ups) so you and others can get a better idea of Lance's sculpting style . . . it is quirky but I like it. Good to have you back on-line: best wishes. A very nice collection sir! My best hopes to you and yours. Thank you two for your kind comments. Hopefully it won't be too terribly long before I can get them onto the table top. I love the neatness of your 18th Century armies and their deployment. I think you've captured the logic and appeal of limited warfare. Thank you, Doug. The 18th century is wonderfully colourful indeed . . . and a joy to explore.